Javier Echave serves as chief financial officer of Heathrow Airport Holdings since May 2016. He is responsible for leading the organisation financially and to give passengers the best airport service in the world whilst delivering £1bn+ EBITDA growth over the current regulatory period. Mr Echave did so by enabling a volume based strategy and transforming Heathrow’s approach to cost and investment. 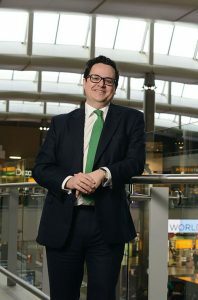 He leads the investment appraisal of Heathrow’s multi-billion capital plan – working with airlines, the Department for Transport and the CAA to ensure Heathrow’s expansion plans are financeable and provide value and service for passengers while keeping airport charges close to current levels. Mr Echave’s responsibilities also include the management of Heathrow’s £13bn debt portfolio through a multi-rating, multi-currency funding platform. Me Echave is a member of Heathrow Airport Holdings board of directors, chairman of Heathrow’s Fire Safety Board, and alternate company’s director at NATS Holding board of directors. Mr Echave joined Heathrow in January 2008 and his achievements include establishing Heathrow’s current capital structure and positioning Heathrow as a strong credit in the financial markets, collaborating to transform passenger service, and delivering an ambitious cost efficiency programme, setting Heathrow’s financial investment appraisal capability and leading the transformation of the Business Finance team to become a genuine strategic business partner. Prior to joining Heathrow, Mr Echave worked in infrastructure, services, and facility management in the UK and Spain with Ferrovial. Mr Echave is married. The couple has two sons.